2.25x12 Wicker Brushed Nickel Floor Register Discounts Apply ! These brushed nickel floor registers will give your home a classic look with this traditional wicker design. Your 2.25 x 12 metal floor vents feature a quality plastic damper that is completely adjustable. Brushed nickel floor registers have a superior topcoat to protect the finish. 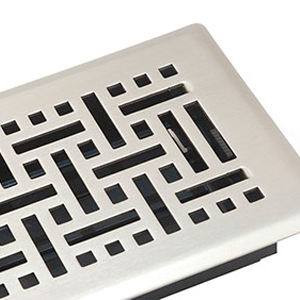 The body of the metal floor vents is constructed of a strong steel core for added durability. Brushed nickel floor registers in this wicker pattern are a great investment in both price and style. ***Hint: The industry standard to order brushed nickel floor registers is to use the actual hole opening size and not the faceplate size. These metal floor vents will fit a 2.25 x 12 inch hole opening. 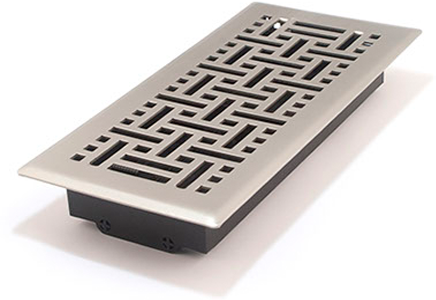 You can purchase these metal floor vents in other sizes and different finishes. Order your new brushed nickel floor registers today to change the look of your home or office!